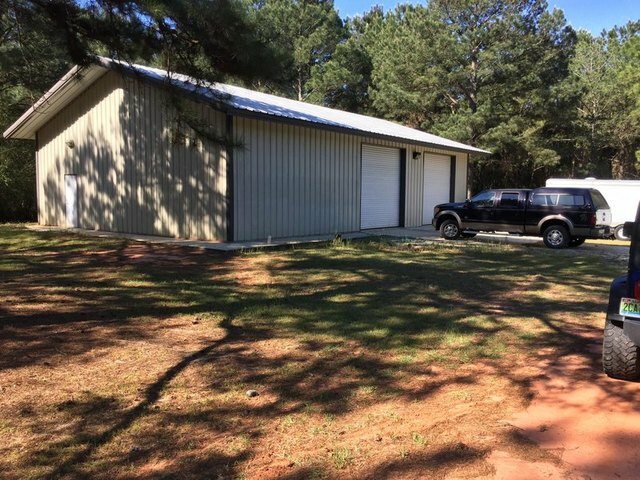 FOLEY, AL - Real Estate and Person Property - Coastal Auction Co., Inc. FOLEY, AL - Real Estate and Person Property - Coastal Auction Co., Inc.
ABSOLUTE AUCTION – Selling 3 acres with like-new 40×60 metal building, 2 overhead doors, side entrance door, concrete floor, and concrete pad for RV with electric hookup and water well. Excellent building site! Selling (3) Acres with like-new 40′ x 60′ metal building that has (2) overhead doors, side entrance door and all concrete floor. Property has a concrete pad with electric hookup and water well for RV or Motor Home. Excellent building site for a home! Nice area and near all medical and shopping areas. Close proximity to Weeks Bay. Personal property will include a tremendous amount of good lumber, some farm equipment, like-new lawn mower, hand tools, some furniture and many more items. Full Lot List will be posted online shortly so please check back. Real Estate Terms: 15% Down Day of Sale and balance with free and clear deed within 30 days at closing. Property taxes prorated. 10% Buyer’s Premium will be added to determine final sale price. Personal Property Terms: Cash or Good Check. Charge cards will incur 3% surcharge. Full payment auction day prior to removal of any item. 10% Buyer’s Premium will apply. From Foley, travel west on Hwy. 98 to Magnolia Springs, and turn South on Hwy. 49 (Magnolia Springs Highway). Then go West (Right) on CR-26 to Nelson Lane and turn South. Auction Signs Posted at property.